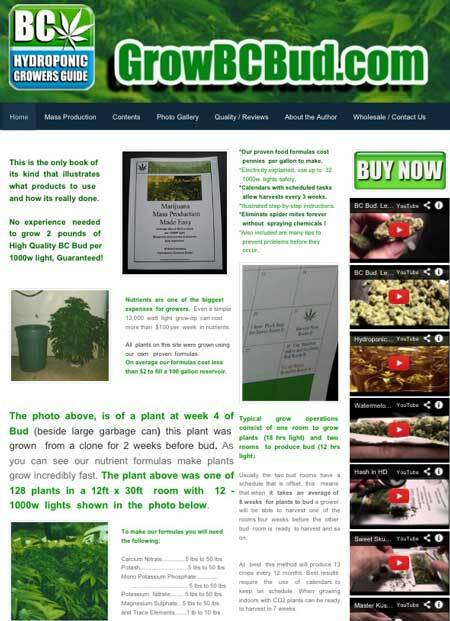 Hey everybody, it’s Mr Green here from www.GrowBCBud.com with some free advice about making cannabis cloning as easy and quick as possible. Today you’ll learn how to clone your marijuana plants successfully every time! I’ve been growing marijuana on a large scale since 1990 and have made thousands of clones over the years. 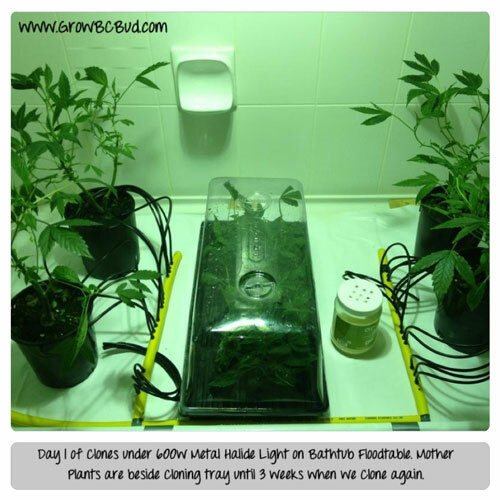 The following is my best advice to get your clones rooted fast, in just 7-10 days. Supplies Needed – Get Your Cloning Supplies! Grow Lights: Fluorescent Lights or Metal Halide lights (250w, 400w or 600w) seem to work best for cloning, however any quality grow light can be used. To begin we will fill one of the small buckets with warm water. 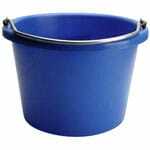 Put the other bucket aside for now, as we will use it in a moment. Next, we soak the Jiffy 7 compressed peat pellets in the warm water, which makes the pellets expand in size, as pictured below. 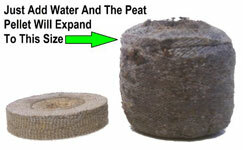 Once the compressed Jiffy 7 peat pellets have expanded in warm water, we remove them one at a time. 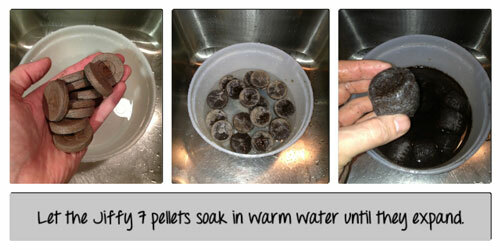 Gently squeeze excess water from each pellet before placing in cloning tray. Once the cloning tray is filled with expanded warm wet Jiffy pellets, we are ready to begin cutting our cannabis clones. Let’s fill the other bucket with cold water now. 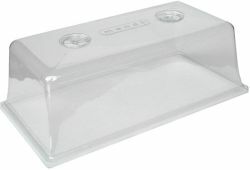 We will use this to hold our new clones. When cutting clones from a mother plant it is better to cut a large section of a branch with multiple branches and bud sites. Bigger branches will support bigger buds. A small clone may take a week or two before multiple branches appear. 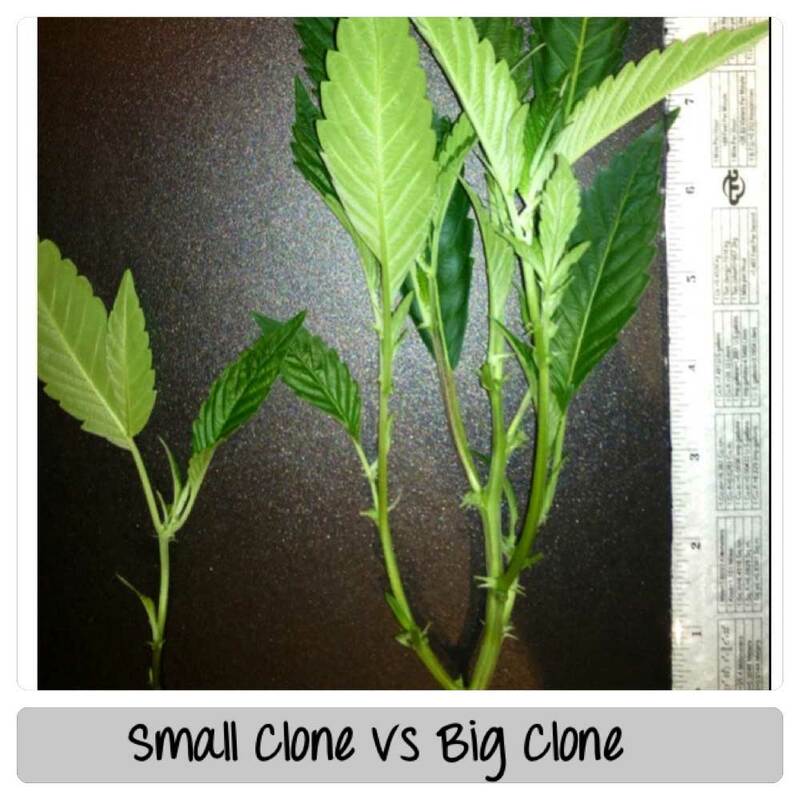 This photo shows the difference between a small cannabis clone vs a big clone. You will get faster growing and more vibrant plants by choosing big clones! Using a new razor blade, cut the branch of the mother plant at a 45-degree angle. This “branch” will be your new clone! Place the new cutting in the small bucket of cold water you just prepared. The stem of the cut branch will absorb some water while soaking. This prevents air bubbles from getting trapped in the stem. 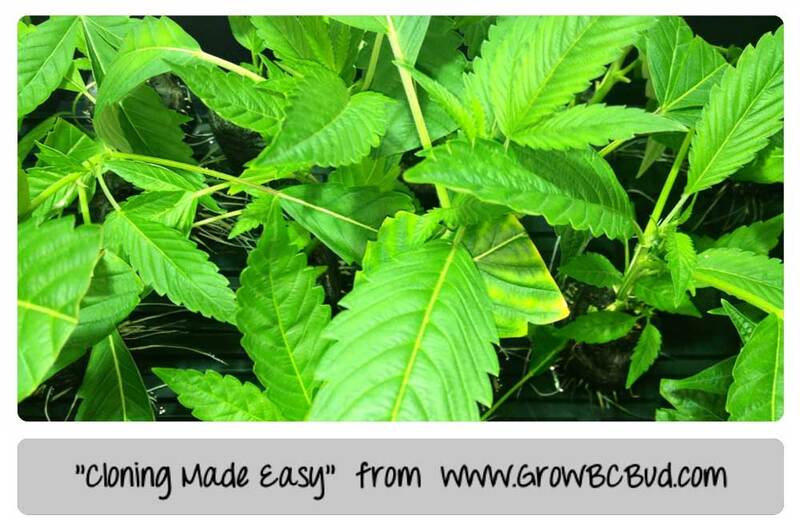 If your cutting has large fan leaves you should cut the blades of the leaves shorter to fit in the cloning tray. This way the fan leaves will still remain and speed up the growth of the new cannabis clone. Once you have all the branches cut and soaked we are ready to dip the tip of each of the cuttings (soon to be clones) into the rooting gel. Dipping the clone in gel first will protect the stem from getting clogged. After the clone is dipped in rooting gel we will dip the tip into the rooting powder. This method is what I call “Double Dipping the Clones”. 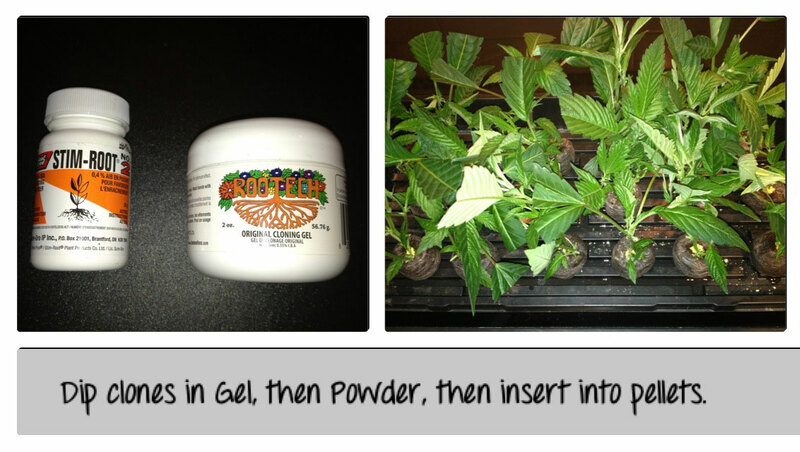 I do this because some strains root better in gel, while others root better with rooting powder. This way each clone will always root no matter what. 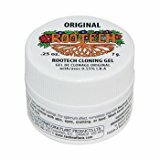 Any brand rooting powder and gel will work for cloning. After the clone has been double-dipped, you will insert the cutting into the Jiffy 7 peat pellet. Gently press the peat in the Jiffy 7 around the base of the stem to ensure a snug fit and to ensure contact of the peat with the stem. We don’t want the stem loose or falling out of the peat. Note if you’re using Rockwool: Rockwool cubes usually have a small hole for the clone to be inserted. Just be sure you have a snug fit between the stem and the cloning cube. Once all the clones are inserted in the pellets I add a teaspoon of water to the base of each stem to activate the rooting gel and powder. 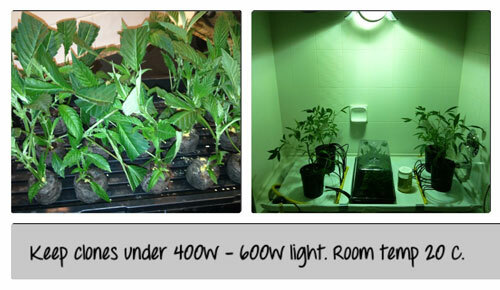 The next step is to spray the clones with water before moving the clones under the light. 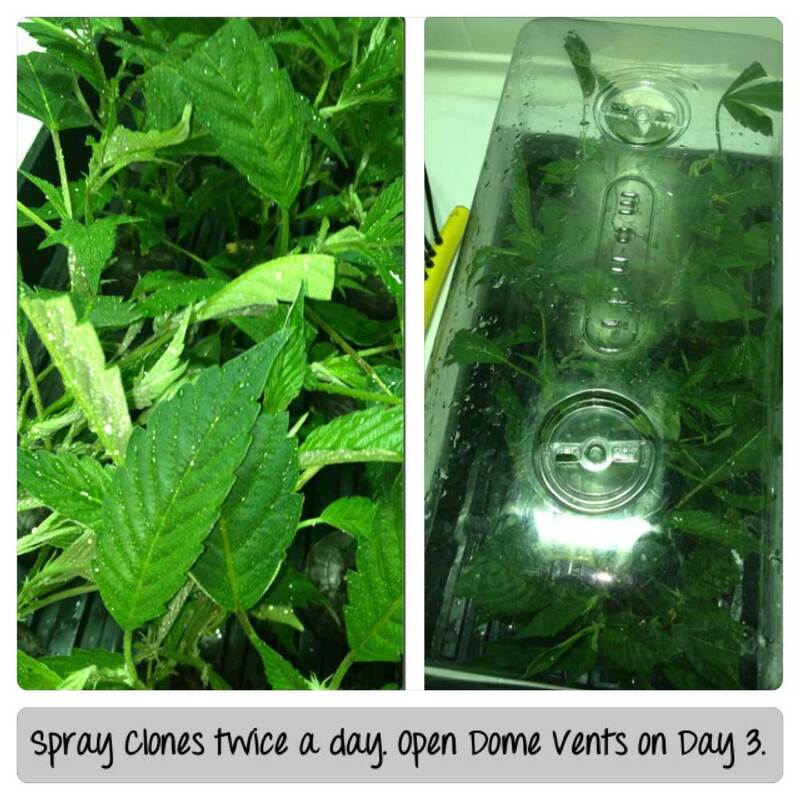 When spraying the clones with water make sure you spray the inside of the dome and the base of the cloning tray. Fresh cuttings need high humidity to encourage root growth. Now place the dome on the cloning tray with the new clones inside. Leave the light on 18 hrs per day for cloning. Try to give the clones as much light as possible. More light makes clones root faster. If using fluorescent lights or CFLs you can keep the light 1 or 2 inches over the top of the dome. If using a horizontal 400w or 600w Metal Halide light keep the light about 24 inches away from the top of the dome. Make sure the vents of the dome are closed for the first 2 days. Keep the room temperature slightly warm, above 20 Degrees Celsius (68 degrees Fahrenheit). That’s it for now! You’ve made it through the first day, which means you’ve made it through the toughest part of cloning! Remove the clear plastic dome from the cloning tray and spray the clones and inside of the dome with water. Place the dome back on the tray when done. It is best if you spray the clones in this way at least 2 times per day. 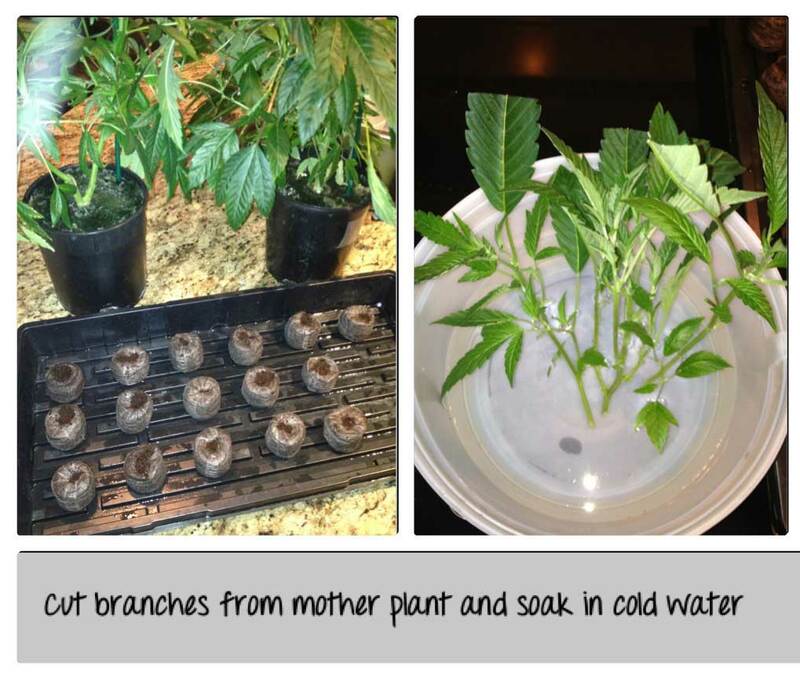 Spraying a clone with water dilutes the nutrients in the leaves. The clone will be forced to search for nutrients once the leaves have low nutrient levels. Misting also helps maintain water levels in the plant since it can’t drink through the roots. Spray clones once in morning and once at night. Open the vents in the dome of the cloning tray today. We want the moisture to escape now which will dry out the Jiffy 7 pellets. The drying of the pellets will force the small bits of root to grow quickly in search of moisture. Keep vents on dome open and spray clones once in morning and once at night. Hopefully by this point each clone is standing up on its own. Keep vents on dome open and check to see if pellets are dry. If the Rockwool or Peat Pellets are dry to the touch we will add half a liter (~2 cups) of water to the cloning tray itself which will fill the grooves in the bottom of the cloning tray. Important: If you add water, add it to the cloning tray itself to fill in the grooves at the bottom of the tray. Do not add water to the tops of the pellets at this point, or roots will take longer to form! The pellets will absorb the water from the bottom of the cloning tray. We want the roots to search for the moisture, and forcing them to move downwards to find water will force the plant to root more quickly. Adding water over the top of stems now will make it take longer for clones to root. Do not add water to the tops of your pellets! Close the dome vents on Day 6. Keep spraying clones once in morning and once at night. You should now see some roots breaking through the Jiffy 7 peat pellets for several of the clones. We have closed the dome vents again on Day 6 because we want extreme humidity now that clone roots are starting to show. Trapping the water in the tray with vents closed creates the best environment for roots to grow rapidly. Continue spraying clones twice a day. By day 7, roots should be showing on at least 50% of the clones. Keep the vents closed on dome. We need to maintain high humidity until day 10. By day 8 or 9 you should see roots on 90% or more of the clones. 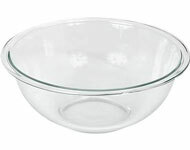 At this time you should add half liter of water (~2 cups) that has been infused with a light concentration of grow nutrients to the grooves in cloning tray. Keep vents closed on dome which will add nutrient to the humidity in the cloning tray. 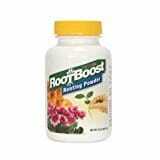 Over the next day roots may triple in size. Continue spraying with water for day 8 and 9. 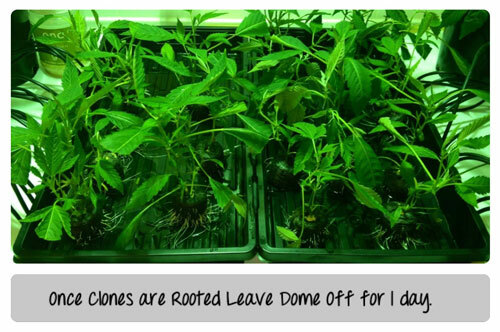 Remove the dome on the cloning tray today to allow clones a chance to adjust to normal humidity. 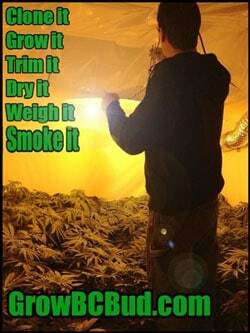 Clones may be transplanted to dirt or Rockwool anytime when you see roots. 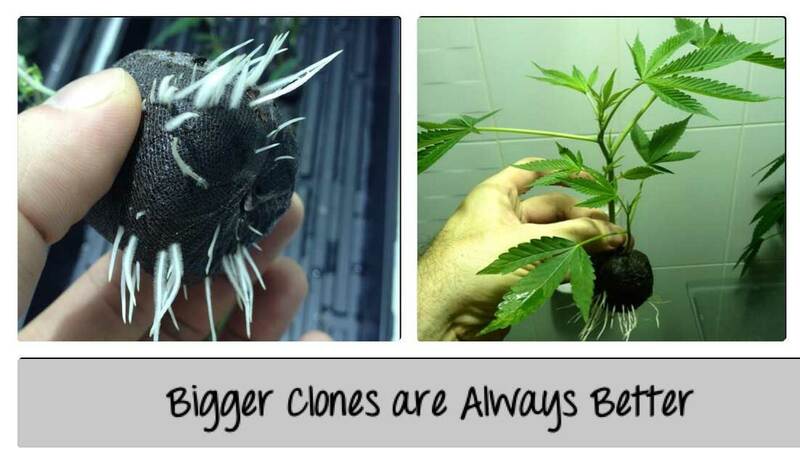 If you want bigger plants, take bigger clones! I’ve recently been growing marijuana at home in my new condominium apartment. As a result, I needed a place to keep Mother Plants, Clones and a place to Veg the Clones. I discovered that my spare bathroom is the perfect place for the job. 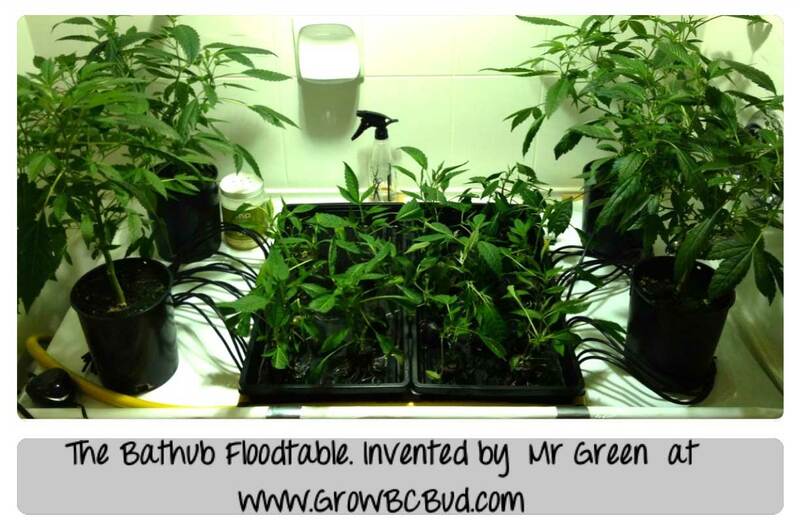 The bathtub floodtable is a piece of plywood 2ft x 4ft in size. I’ve covered the plywood with 2 layers of B&W Plastic. The plywood is raised 2 inches at the front edge of the bathtub which makes the water run downhill towards the tile wall at the back of the bathtub. The nutrient drips off the floodtable into the bathtub to be recirculated again. The bathtub acts as the reservoir holding the hydroponic nutrients. A submersible water pump forces the nutrients up onto the floodtable through 1/2 inch tubing that leads to spaghetti hose for each plant. Nutrients drain out of the pots while plants are being fed. This method is what I call “Flush & Feed”. Excess nutrients are being Flushed out of the Rockwool while the Plants are being Fed nutrients. 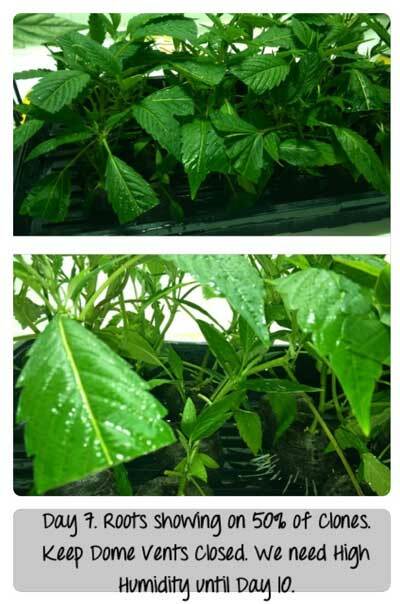 Plants cannot be overfed with this method of hydroponic growing. Plants are fed several times per day as programmed by a digital timer. I also have an air pump with air stone in all my reservoirs keeping oxygen in nutrients at maximum levels. More information and instructions how to build custom floodtables are included in my book “Marijuana Mass Production Made Easy”. I was born in British Columbia and started growing marijuana on a commercial scale in 1990. I designed and built grow rooms in nearly 20 different locations over the years, and worked as a consultant for major size grow-ops. The cover of the book has images of my basement which held 24 x 1000w HPS lights. My education with hydroponic grow systems began in 1991 under the supervision of University Botanists who were developing a special nutrient formula for the cannabis strain Northern Lights. Since then I’ve learned advanced techniques to improve the quality and yield per light. I’ve read dozens of books and always wanted to find one that tells the reader exactly how to get professional results without having to perform experiments, and without having to sort through pages of re-hashed common info about how plants grow. The book I wrote, “Marijuana Mass Production Made Easy” has the condensed instructions of how to average 2+ lbs per 1000w light. I was diagnosed with Crohn’s Disease in 2012 and am now Licensed by Health Canada to Grow my own plants. 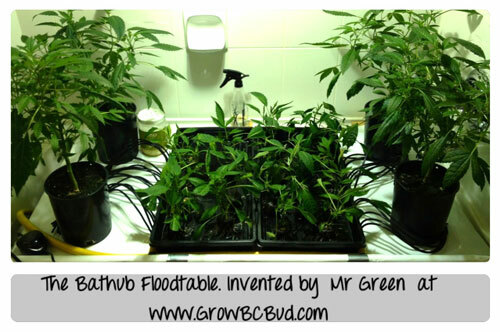 All the photos and videos on my website, www.GrowBCBud.com are from rooms I built and plants I grew. Share my pics and videos with all your friends. 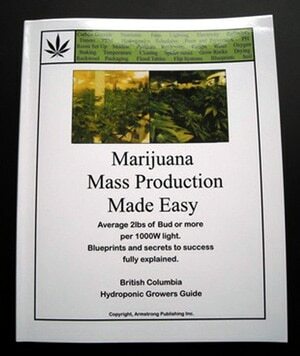 My book “Marijuana Mass Production Made Easy” shows you how to grow 2 lbs or more per 1000w light and includes instructions on how to grow 12 lbs every 3 weeks in 1000 sq ft room. The book includes the hydroponic food formula I use that will make your plants grow Bigger and Faster than ever before. I make growing easy for anyone to understand with basic instructions of what to do so you achieve awesome results every time. Get Your Supplies To Follow This Cloning Tutorial! Note: Because these are bulky but lightweight, these items are usually much cheaper to buy in person without having to pay for shipping (can be found at most plant nurseries and gardening stores). Although not necessary, the reason the following tray is white on top is this style helps reflect light back up at the plants (though it costs a little more than a regular propagation tray). Grow Lights: Fluorescent Lights (including CFLs) or a Metal Halide light (400w or 600w works great). However, you can use almost any grow light successfully as long as you keep it at the correct distance away. Where to buy quality strain genetics? What’s wrong with my plants?